A unique area dedicated to wine and olive oil tastings at the heart of the show. 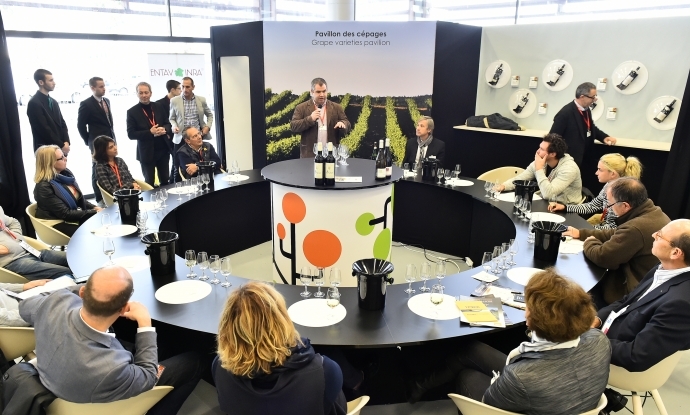 In partnership with The French Vine & Wine Institute (IFV), a series of original and relaxed tasting sessions will be presented by winegrowers and professionals from all major French wine regions. These tastings are accessible to wine buffs and beginners alike. Online registration is compulsory (places are limited). The unconditional charm of rosé: discover the sensorial and aromatic profiles of rosés from four major French wine regions. The expression of pinot noir in Burgundy and the Loire Valley: Tasting the same grape variety, the pinot noir, grown and vinified in two major wine regions. Cabernet sauvignon in all its forms: An analysis of a leading international grape variety, one of the secrets behind the success of Bordeaux but also a rising star in California, Australia and South Africa. The multi-sensory experience through wine: Interested in having a sensorial experience while also testing your knowledge? Then this workshop is for you. You will discover what lies behind sensorial perception and what this actually means for wine tasting. AFIDOL offers a true journey of initiation at the heart of olive oils from the South of France to discover and taste these pure fruit juices, then go a step further by examining culinary pairings! Beginner's guide to tasting olive oil from the South of France: How to taste olive oil? Recognising the three main categories of taste. Discovering single variety oils from Occitanie: Presentation of main olive tree varieties in Occitanie. Tasting of single variety olive oils. Discovering French Denomination of Origin olive oils - intense taste: Presentation of the various French appellations and tasting of PDO olive oils with an intense, fruity green taste. Discovering traditional taste olive oils / matured olives: Presentation of traditional taste (à l'ancienne) olive oils and tasting of PDO olive oils from matured olives. Discovering olive oils from the South of France - delicate taste: Presentation of category of delicate taste olive oils and tasting of delicate taste olive oils.